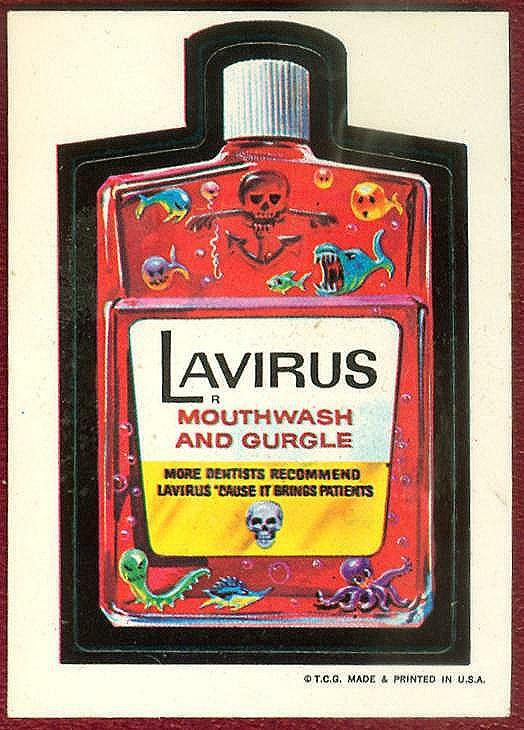 More Dentists Recommend Lavirus "Cause It Brings Patients"
Lavirus is a very long-lived Wacky Pack, having appeared in nine sets over two decades. The 1st series Lavirus is tough to find, and although 1st Series tanbacks are rare, the Lavirus tanback is not. It was reprinted identically as a tanback in the WonderBread set, along with Tied and Gadzooka. The 1st and WonderBread Lavirus can be told apart by the die-cut lines around the cap.